The guys I grew up and am still friends with are all avid anglers. As far back as junior high school, we used to skip class and go fishing. We’d load our gear on the back of our bikes and spend the day at our favorite spots around South Miami. We’d be sure to cover up with hats and sunscreen so as not to come home with telltale tans that would get us caught and grounded. pilchards, cigar minnows and a few goggle-eyes. 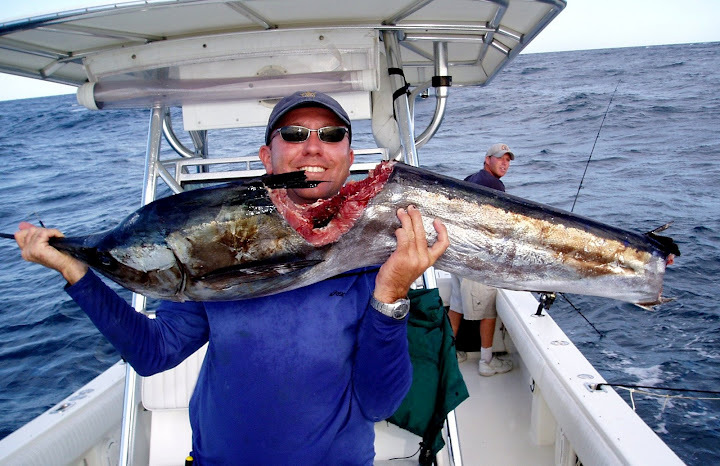 The way we fish is for sailfish is relatively simple. We stop the boat between 80 and 160 feet of water, shut the engine down, turn sideways and put out a sea anchor. This is a large canvas sock tied off to the bow which catches the water and slows the boat’s drift speed. The breeze was out of the east, which would blow us from deep to shallow, so we put out our sea anchor and began our drift in about 160 feet of water. grab it and eat it while still on the hook. Otherwise the fish will knock your bait off of the hook and eat it, but you will miss your shot at catching it. were shooting for, but great table fare none the less. I cut a small slit just behind the gills and ‘bled it’ over the side of the boat. This is done with tunas because they are very bloody fish and to remove some of the lactic acid that has built up in the meat during the fight. Lactic acid degrades the quality of the meat. I washed it off and put it deep into the ice in the cooler. We were glad to have some dinner in the boat. I re-baited the hook, casted it back out and waited for our next opportunity. A few minutes later, the line on the top water rod nearest to my buddy popped off of the copper and began ripping off of the reel. He gave it a few seconds to run, closed the bail and came tight on the line. It started screaming line off of the reel like a rocket. This was followed by a huge explosion and splash as a beautiful sailfish broke the surface repeatedly. having too much line taken off of the spool. It’s also better for the fish, as it shortens the fight, thereby reducing the stress on it. I ran around the boat and reeled in all of our baits, pulled the sea anchor, started the engine and began the pursuit. warranted. My buddy had the angling experience to play it perfectly and after about 20 minutes or so, he had the fish alongside the boat. A couple of high fives and photos later we began the task of reviving the sailfish. This is done by holding the fish in the water by the base of the bill and idling forward slowly. By moving the fish forward through the water, you increase the oxygen going into the gills. After a few minutes, the fish will begin moving, wagging its tail and biting on your hand as you hold it. This is when you know it’s okay to release the fish. more extreme measures. He found a dive mask, grabbed the fish by the bill and jumped overboard with it. was that he refused to let go of the fish in the process. He was stuck flailing on the bow-rail, half in and half out of the water. He was screaming, “Get us in the boat!!! Get us in the boat!! 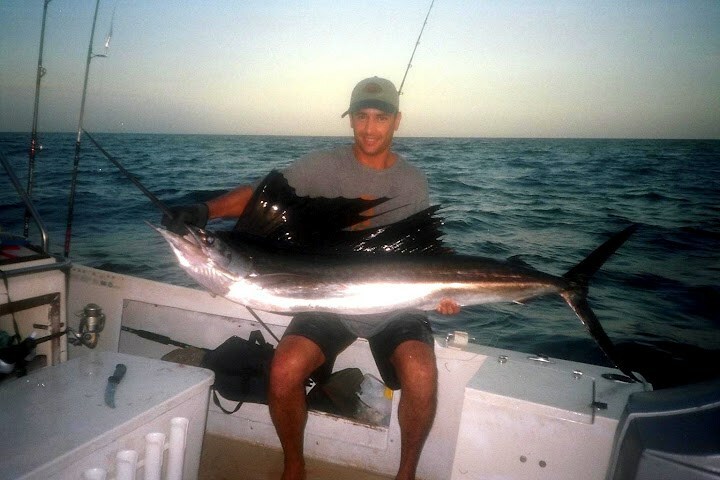 !” He was holding onto that sailfish as if it was his first born. He told me that while he was in the water with the fish, he felt like something was watching him. He looked down to see a ten foot, 500 pound bull shark coming right for him. It was agitated and ‘lit up’ with its pectorals and dorsal fin pointing straight out in an attack posture. There’s no way to know how long the shark had been watching the action and following the sailfish. Possibly, it had been in the area since we bled the tuna. The blood in the water probably hadn’t helped the situation one way or another. As we feared, the sailfish did not survive the ordeal. We were really bummed out, but we figured that since it did die, we’d at least make use of it. We ended up taking it home and having the meat smoked. It came out excellent and we had plenty to share with friends and family. Not what we wanted, but at least the fish did not go to waste. After the ordeal, we cleaned up the boat, got ourselves together and put out more lines. We wound up having a stellar day. We caught two more nice tuna, a big kingfish and a sizable mutton snapper. On our final drift we caught another sailfish. This one was released happy and healthy to fight another day. Next Next post: Salmon Fishing in Chicago: Who Knew?